At the time of writing, Brefo Mensah of ASEC Mimosas has played two matches in the MTN Ligue 1, three matches in the CAF Confederations Cup and as far as I know, two matches in the Ivorian cup. Based on his inexperience, it may be a bit premature to present the Ghanaian youngster as a player to watch. However, the performances of Mensah have been remarkable and he is already a big favorite amongst the fans of ASEC Mimosas, traditionally the top club in the Ivory Coast. Some of the fans are already referring to Mensah as “Ronaldinho” because of his amazing skills. The excellent website of ASEC Mimosas, www.asec.ci/, contains a lot of information about Mensah. Mensah is apparently born 21.10.1992, he is 170 centimeters and he is 56 kilos. Mensah is described as a left-footed left-midfielder / left-winger. He can also play as an attacking midfielder and is comfortable in a free role behind a lone striker. Mensah is a product of the Feyenoord Academy, based just outside the Ghanaian capital Accra. In June 2004, the Feyenoord Academy participated in the so-called Marveld Tournament in the Netherlands. This is a tournament for U-15 players. The 2011-tournament is for players born on 01.01.1996 or after 01.01.1996 and I therefore assume that the 2004-tournament was for players born on 01.01.1989 or after 01.01.1989. This theory is backed up by the 2004-squad list of Ajax Amsterdam that contains several well-known 1989-born players such as Toby Alderweireld and Vurnon Anita. If Mensah is born 21.10.1992, this will actually mean that he was only 11 years old when he participated in the U-15 tournament. In 2010, the Dutch newspaper www.volkskrant.nl made a report on the Feyenoord Academy from Fetteh. The coach of the academy, Sam Arday, pointed out four players that he thought could break through as footballers, including Brefo Mensah. During the season 2010-2011, Mensah had a stint at the Tunisian top club Stade Tunisien. I am not sure if this was a loan period or just a trial. Mensah was described as an 18 year old player in December 2010 by Tunisian media. In February 2011, www.letemps.com.tn printed an article where Mensah was described as a very promising player that had impressed during his stay at Stade Tunisien. Due to financial problems, Stade Tunisien was not able to sign Mensah permanently. I cannot find documentation proving that Mensah ever played an official match for Stade Tunisien. As far as I know, Mensah joined ASEC Mimosas in July 2011. On 17.07.2011, Mensah made a substitute appearance for ASEC against Club Africain in the 2011 CAF Confederations Cup. He impressed the fans of ASEC immediately and eventually made the assist when Hugues Zagbayou gave ASEC the lead. Mensah started the next match in the CAF Confederations Cup – on 31.07.2011 against Inter Luanda. On 14.08.2011, Mensah played for ASEC against Kaduna United FC in the 2011 CAF Confederations Cup. Mensah became the match winner when he scored in the 69th minute. 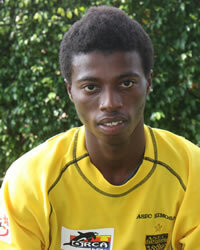 On 17.08.2011, Mensah made his debut for ASEC in the MTN Ligue 1 2010-2011. Mensah is described as an extremely skillful, tricky player with tremendous speed and a great left foot. I am pretty sure that Mensah has some extraordinary qualities and if I were a scout I would consider checking out this player. It is not very often I read such amazing reviews about such an inexperienced, young player. Mensah should also be a candidate for the Ghana U-20 national football team – a team that could obviously use some fresh talent after their poor performance in the Orange African Youth Championship earlier this year. The picture is taken from www.asec.ci/.